If you love making things you should take a look at these 25 Genius Craft Ideas! Some of them use repurposed items and transform them into something new and useful. You can decorate your home or office with the many crafts you can create with very little time or effort. Whether you are itching to make something cool or you want a project your kids can help with, there are several things to choose from. Get ready to get your craft on with these unique ideas. Transforming old items into something useful is fun and on the verge of genius! For example, if you have an old crib sitting around or find a good deal at a yard sale, you can create the most awesome children’s art table. Learn how to make an insanely easy marker caddy in under ten minutes with very few supplies! Not only is it completely functional, but it looks fantastic on your desk too. Add a stylish look to your mantle or shelving with these yarn wrapped painted jars. They are simple to make and the result is awesome! Plus, you can even hand these out as gifts too. Forget boring mirrors, transform an inexpensive dollar store mirror into a work of art. This polka dot mirror is easy to make and is perfect for a beginning DIY’er. Make these simple mini pallet coasters with washi tape in no time at all. You can customize them to fit your style. Plus, they will be perfect for a man cave or rec room! Take a look at this spectacular dinosaur serving tray! Makes me wonder why I didn’t think of this sooner. Great idea if you have an upcoming kids party or just want something cool to serve cookies on. You only need 4 materials to create fabric art that makes a big impact on your space. Personalize with your favorite colors and designs for purely unique art. Picnics, barbecues and summer parties are the perfect place to use these easy picnic utensil holders. They look fantastic and you need very few supplies. Transform bouncy balls into a twine ball lamp that are stylish and charming. These hanging lamps would be great for your office, home, or outdoor living space. Forget your typical wine glasses! Add some character and pizzazz to your stemless wine glasses by adding a punch of color. These wine glasses will be great for your next party too. Making a wooden planter box is not only beautiful but really easy to make too. Add your favorite succulents or potted plants then you will have an incredible centerpiece! Make rustic DIY pallet plaques as gifts or home decor. No matter where you hang your pallet plaque, I promise everyone is going to ask you where you got it from. How cool will it be for you to use your custom made DIY etched wood cutting board? Put your name, designs you love or a funny quote on your cutting board. These also make wonderful gifts. Add character to your front door and enhance your curb appeal with this mason jar vase. Decorating with mason jars is always a plus because they will never go out of style. They always add a country feel when you use them. Transform an old liquor bottle into a working soap dispenser in no time! Perfect for the garage, man cave or basement. You won’t believe how easy it is either! Plus, all your friends will want one too! This hammock chair is so easy to throw together and it can make any room look better! Plus, it is a great place to get comfy and read a book or relax. These superhero magnets are so awesome and would be terrific for your fridge, toolbox or any other magnetic surface. If superheroes aren’t your thing, you could always do something different too. Either way, they look cool and are completely functional. 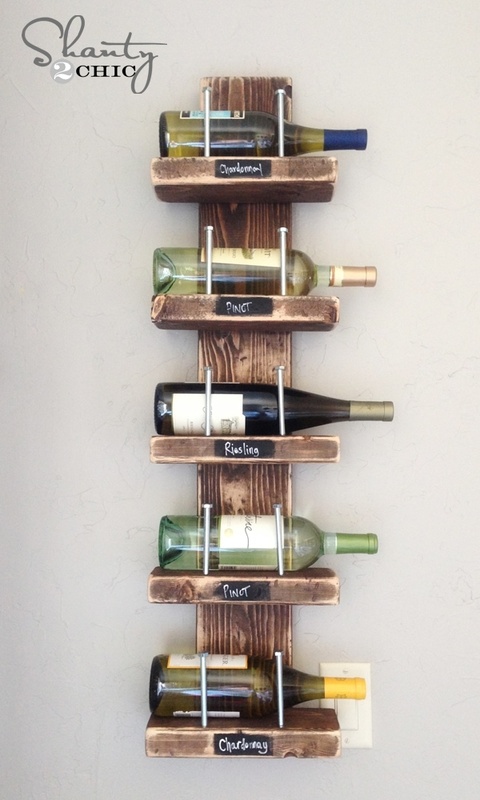 Make this DIY wine rack and you will have a functional way to display your wine bottles that also looks incredible. Use a little bit of chalk and you can write what each kind is while adding to the design and appeal of the rack. When spring is in the air then it is time to start decorating too! These easy fabric covered spring vases are just what you need to add a few pops of color to any room. It is amazing how many ways you can use washi tape. Take a look at these DIY washi tape clocks! These not only look terrific, but your friends and family would also love to receive them as gifts too! You can never go wrong with gold or chevron! That is why these gold chevron paintings are an incredible craft to make. All you need is some canvases, paint, paint brush, tape, stencil and you are ready to create your own art! How cool would it be to have an entire collection of etched glasses that you made yourself? All your friends are going to be jealous when they come over and see them. The best part is they only take about ten minutes to make too! Create a stunning pallet wood letter that will look brilliant on your mantle or front door. The rustic charm will add to elegance to any space. You only need minimal supplies too. If you love sitting in the great outdoors watching birds you should make a wine bottle bird feeder! Each feeder is really easy to make and you can choose all different colors of wine bottles. Plus, you will have some really happy birds! Your garden will look amazing with these easy wine cork garden markers. No more wondering what you planted where! These markers are lovely for small yards or if you use potted planters on your patio or deck.